What a busy, weird and wonderful week! Here's the breakdown. - Took the GRE and didn't do as well as I had hoped. Not shocking, considering I didn't prepare nearly as well as I had planned. - Didn't officially go grocery shopping last weekend, so we've been surviving on odds and ends from the cupboard. While it's been nice to shake things up, I'm ready for my regular rotation of meals! - After ten days of remixing my clothes, I have come to the conclusion that I didn't pick a very good combination of items for the month. The next three weeks might be interesting, and by interesting, I mean embarrassing. Good thing I have no shame! As usual, the + list is much longer and much more exciting. + Spent all of Monday (12+ hours!) working with Jeromy on my Good Mood Blogger video, and had a great time creating something that we're both excited about. + Never have to take the GRE again. Hooray! + Turned my training around this week and even did a tempo run on the treadmill. If I can't motivate myself to run faster outside, then I will let the treadmill do it for me. + I've been trying to take better care of myself. Drinking tea instead of wine or beer at night, reading a book instead of watching one more episode of Parks and Rec, and just generally slowing down. It's working! I've slept better this week than I have in ages. I hope to keep these good habits going. And last but not least: Friday outfit photos! 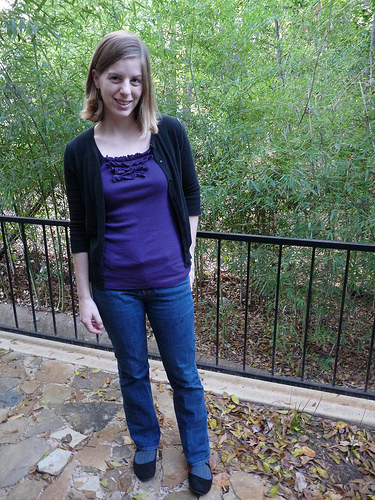 This one is kind of boring, but it's Friday so I get to wear jeans to work as long as I also wear purple. 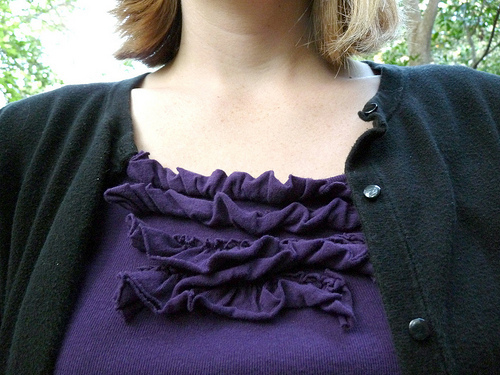 Even though this is a very basic purple tank top, it has some ruffles around the neckline which makes me feel a little more dressed up. How did your week pan out? Mostly +'s, I hope! And if it wasn't, take heart - it's Friday, and that makes everything better!